A Texan is one of the first 18 climate scientists to receive a research grant in the “Make Our Planet Great Again” program launched by French President Emmanuel Macron. The initiative was a direct response to President Donald Trump’s cuts in federal climate-research spending and withdrawal from the Paris Climate Agreement. 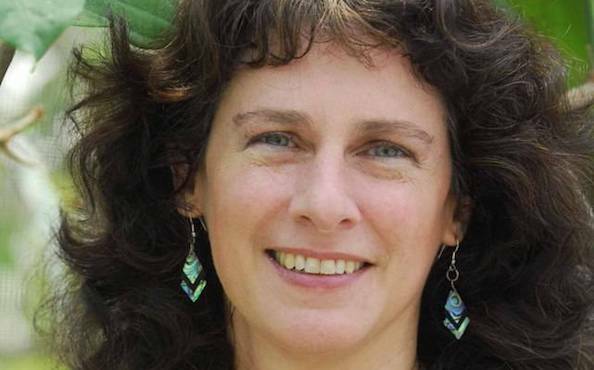 Camille Parmesan, chosen from among 255 applicants, is an internationally recognized biologist who has been on the University of Texas faculty for 17 years. Based at the U.K.’s University of Plymouth for the last few years, she will conduct her French-supported research at a center in Moulis, France. Earlier in her career, Parmesan’s work drew widespread attention for documenting butterfly species’ shifting ranges and linking those movements to climate change. She told Texas Climate News that with the French funding, she would be helping develop practical conservation actions to preserve biodiversity in a changing climate. In addition, she said, she will expand her work exploring links between climate-influenced movements of animals and possible movements of diseases that affect people. The “enlightenment and proactive engagement” represented by Macron’s grant program stands in sharp contrast to the “obstruction and obfuscation” of Trump’s approach to climate change and climate science, Parmesan told TCN. U.S. climate scientists unhappy with Trump’s stance, Macron said, should regard France as their “second homeland,” where their research would be welcome and receive government support. Earlier this month, the French government announced the names of the first 18 scientists, including Parmesan, who would each receive three-to-five-year research grants of up to 1.5 million Euros each. Not all of the recipients are Americans. Will your participation in the French initiative mean the end of your UT affiliation, which has continued while you’ve been on the faculty at Plymouth? I will be keeping my UT affiliation in the Jackson School of Geosciences for sure, and Plymouth would like me to retain some sort of affiliation there, which I’m happy to do – details to be worked out. Will your work in France represent a continuation of your work at UT (and later at Plymouth) or more of a new research direction for you? It’s not totally new, but I will be focusing on aspects that have been more tangential to my past research. I’m best known for documenting the global patterns of responses of wild species to climate change, and linking those large-scale patterns to human driven climate change. I’m moving more into studying the processes behind those patterns (i.e. what’s happening within populations in their behaviors and potentials for evolution), and into working with economic modelers to come up with concrete actions we can take, even when the future is uncertain, to help preserve biodiversity in the face of rapid climate change. So moving more into some practical approaches for conservation managers and policy makers. I’m also expanding some pilot work done in my lab on linking the movements of animals (that I’ve been documenting for 20 years) to possible movements of diseases that can affect humans – so how changes in the wild may impact human health directly. What are your thoughts on the contrast between the French government’s stance toward climate research and the corresponding government approach now in the U.S. (and at the state level in Texas, if you care to be that specific). Ha! The two could not be more different! There’s obstruction and obfuscation on one side and enlightenment and proactive engagement on the other. Do I need to spell it out for your readers? The White House and Texas are eye to eye on this – Trump glories in obstruction and obfuscation, while Macron elevates the world with enlightenment and proactive engagement. The Texas state government started before Trump got in the White House, and has only become worse since. I’m a third-generation native Texan, longing for the next LBJ to bring Texas into the 21st century. Texan Lyndon Johnson – LBJ, as he was and still is commonly known – was the first president to mention the environmental hazards posed by carbon dioxide emissions from fossil fuels in 1965 remarks on the global reach and impact of air pollution. The volunteer members of TCN’s Advisory Board have no authority over editorial decisions, which are made independently by our staff of journalists. When we report on Advisory Board members, their work and publicly stated views, we strive to do so impartially.